Let’s face it, traveling can stressful, especially if you bring your pets along for the ride. We regularly bring our dogs on 10 – 13 hour car drives, which can lead to quite a few messes , especially when you take into account we grab quick food that we eat on the go. Things can get even trickier when you are living out of a hotel room for a week. To make things easy on us for work and fun, we try bringing with us a variety of helpful items to make working on the go even easier. 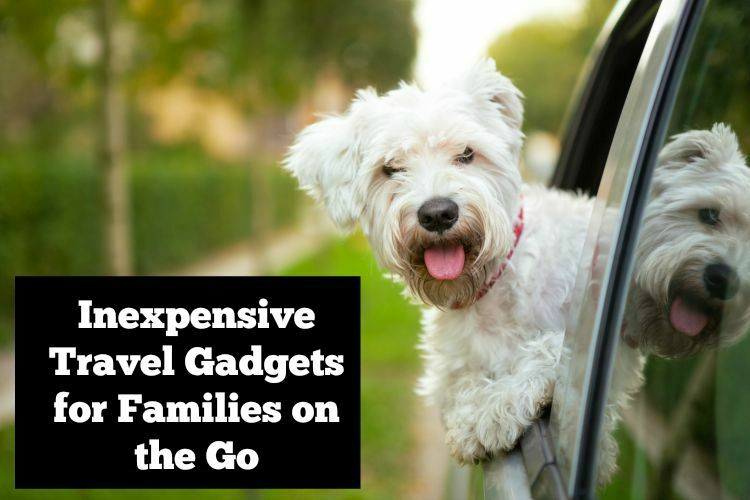 You may even be surprised how inexpensive some of these nifty gadgets can be for people who are constantly traveling! Looking for a small keyboard that can easily fit in a purse or travel bag? 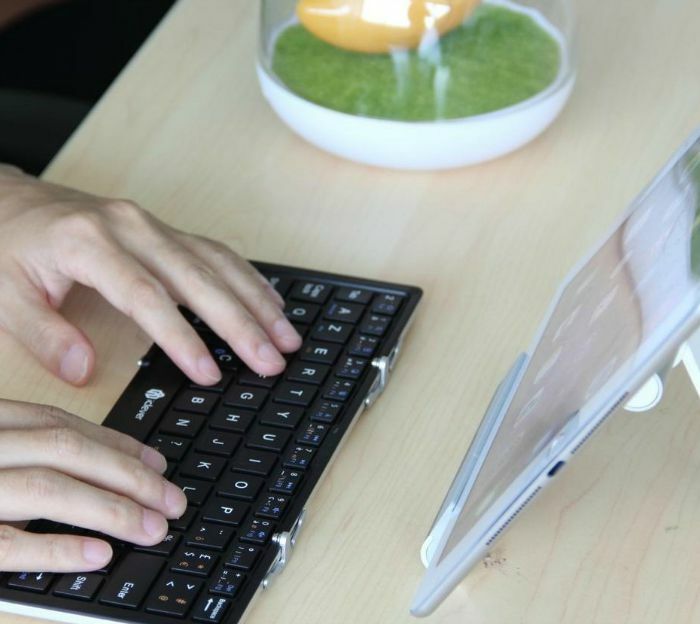 If so, we think you will love the iClever Portable Foldable Bluetooth Mini Keyboard. This little pocket sized keyboard is lightweight, ergonomcal, and designed to last, making it great for anyone who is trying to work on the go from their smartphone or tablet. Since it can work with any Bluetooth enabled system, you can use it with any Android, iOS, or Windows device, allowing you to work just about anywhere, or make it easier to send messages to friends. As well, it is fairly durable and energy efficient, making it a great addition to any travel set. With its small size, we think it is perfect for putting in a small carryon bag so that you can easily play your favorite games on the plane, or while sitting in the passenger seat on a long car trip. Currently, you can buy the iClever Portable Foldable Bluetooth Mini Keyboard for only $27.99 on Amazon.com. Ever been traveling and worried you may have accidentally stained your outfit, or gotten dog drool on your suit? Or worse, that your dog may have had an accident somewhere unexpected? Make finding messes and stains easier with the Esky Pet UV Urine & Stain Detector. Using 51 UV LEDS, this light covers a large area and very quickly points out pet urine, stains on clothing, and more. Even stains that we may not easily see show up under this light, making it a must for pet owners, or people who are constantly traveling. Best of all, it is fairly inexpensive, costing only $12.99 on Amazon. We use this to find pet messes from the puppy, or stains on clothing from being in the car all day. Best of all, it is inexpensive enough that you can keep one at home and another in your suitcase! Want to purchase some of the fun items featured in this article? You can find a large selection of iClever and Esky products on Amazon.com! I really like the Bluetooth mini keyboard and am surprised by how inexpensive it is. Nice find. that small keyboard is kinda cute! Its suit on my pocket/small bag, it is easy to bring when it comes to travelling! But the price is wow! I can get one if I won. I like all of,these and I am pleasantly surprised that they are not expensive. 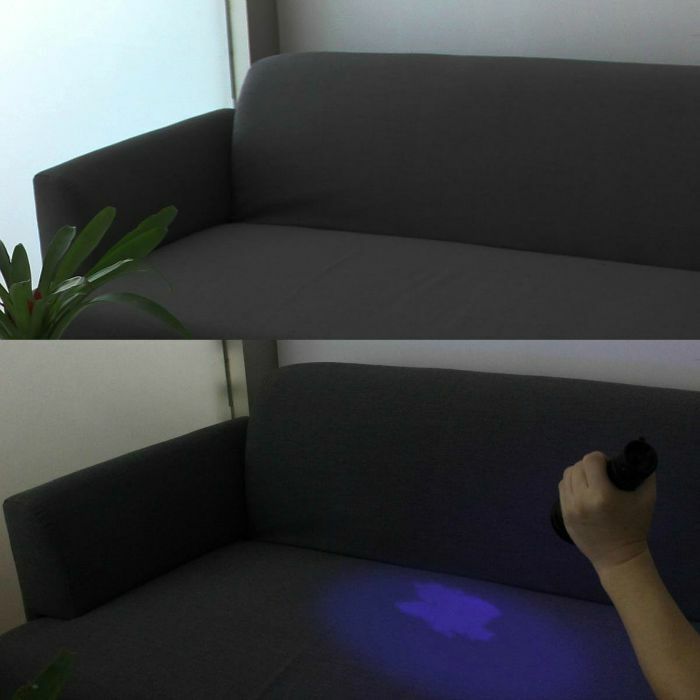 The stain urine detector would also be good for the home. I like the bluetooth keyboard. This would come in handy when I travel on business. I like that it folds up and could fit in my carry on. I love the foldable keyboard. It’s great that it works with both android and ios devices. I could share it with my husband. These are all neat. I am checking them out. I really like the portable keyboard to be able to use on the go; thanks a lot for posting! That keyboard is what I’ve been looking for. Thanks. I don’t like sitting in the car for more than ten minutes. I get very antsy. I usually bring along a crossword puzzle book. 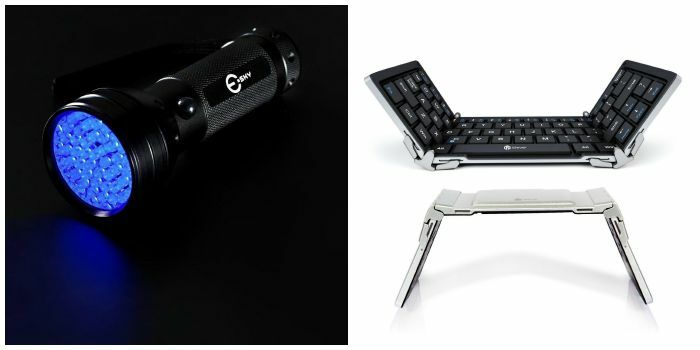 Some of these gadgets are dope! I especially like the pet urine and stain detector.